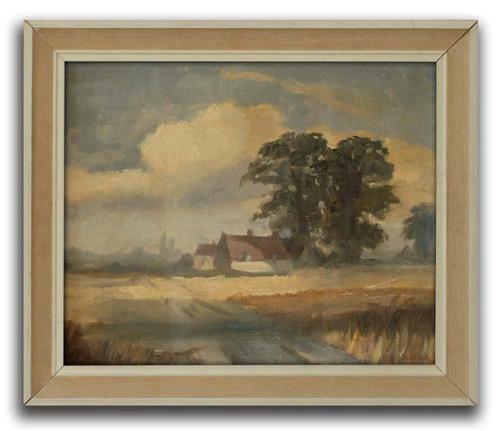 Delightful English landscape in muted tones by amateur artist Reginald Osborne now sadly passed. The charm of this work is intensified by its relatively small scale. The artist's use of muted tones creates a serene end of the day atmosphere. The frame is in good condition and perfectly presentable. But personally I feel that the painting deserves something a little more heavy, possibly dramatic, to contrast with Reg's innate sense of restraint. Shipping: UK mainland delivery is charged at £8.21. For non-UK destinations, including Northern Ireland and offshore islands please contact the seller for an estimate. See terms below.